Call off the search party! Inform the authorities! Stand down the dogs and reassure the fretting relatives! 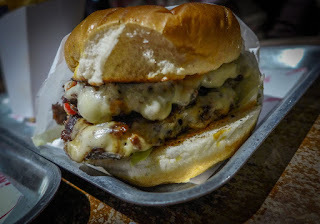 I’ve found Newcastle’s best burger, very much alive and well, in an unlikely spot: a bar just above the Grainger Market. I realise that such an audacious declaration may result in tuts, raised eyebrows and worse. You may think you have found patty perfection elsewhere and, yes: everyone is entitled to their opinion. It’s just that in this case I’m right, and, unless you agree with me, you’re not. I had already tried one of The Grind’s “West Coast Classic” burgers some time ago, on a fine and sunny jaunt round the street food stalls of Newcastle's Quayside Sunday Market. I was initially sceptical, suspecting them to be merely another decent addition to an already crowded scene. The first bite into its double patty and cheese simplicity soon put me straight. 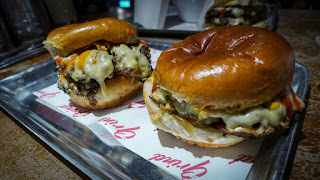 The beef, squished down onto the hotplate, had good charring and the whole business, thanks to briefly steaming the patties with the top of the bun, had a coherence that distinguished it. I looked forward to them finding a permanent site. And now they have, sort of. 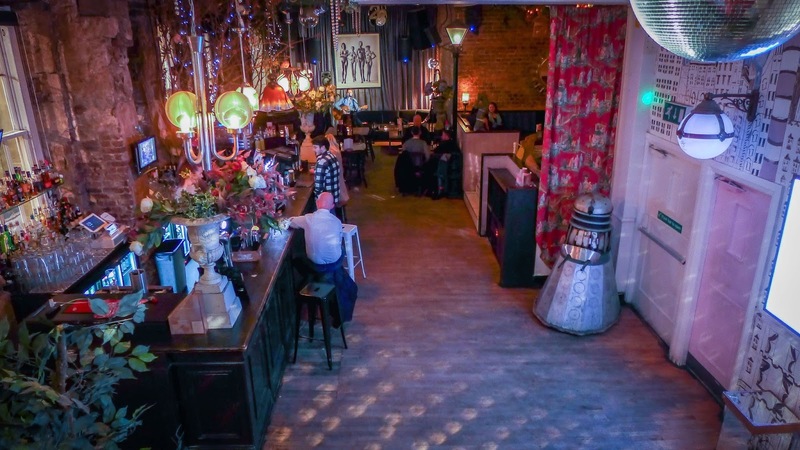 They’ve popped up in a favourite city centre bar, the wonderfully louche No 28. 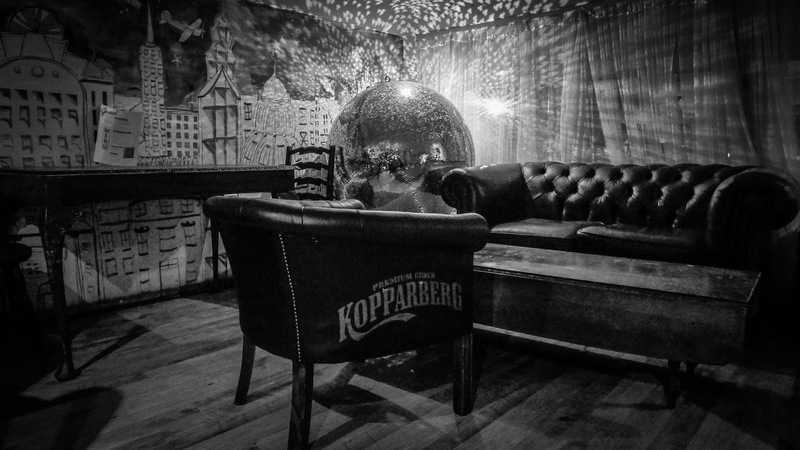 If the Secret Diner reviewed bars, this would have had five stars already, for ambience and audacity. Accessed by climbing a staircase inside one of the entrances to the Grainger Market that face the new Grey’s Quarter, it has the dual appeal of being slightly off the beaten track and having an interior that was begat by a very wild night – or a fertile imagination. Part of it, festooned in plants, has been done up like an indoor garden; there are twinkly lights and glitter balls and a massive arty black and white picture of naked women I vaguely remember dancing under at a way-better-than-average birthday celebration; there’s a Dalek called Derek. And now, at least for the time being, there is The Grind. Over a couple of evenings we tried most of their menu. That West Coast Classic was as good as I remembered from the Quayside. It arrived at the table poking suggestively from its paper bag sleeve. Sometimes less really is more: other than a few wisps of iceberg, some tangy pickle relish and a lick of burger sauce, this is a disarmingly simple burger in which good ingredients and solid technique shine. 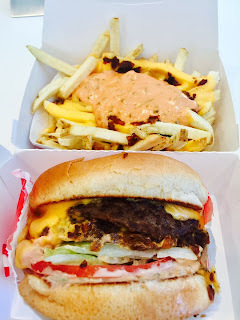 The bun delivers both squish and crunch - it had been lightly toasted - and the assembly was, as they say, on point. There were no idiotic inclusions or affectations, just that glorious one-bite slap of meat, fat, salt, cheese and carb that marks out a really good specimen. The chips are similarly first rate. They arrived humming with the animal scent of cow tallow that made them so wonderfully crisp. Unadorned, they were delicious, their beefiness echoing that of the burger. On another night we tried the truffle/Parmesan version. 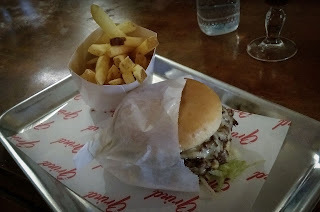 The truffle was lost, the oil carrying its flavour having dropped it somewhere along the way, but the salty-umami thump of the cheese against those fries was quite something. 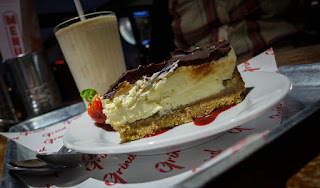 We also battered our way through a couple of other offerings, just to be sure. The “Triple Buffalo” was an imposing creature, in which three patties, blue cheese and Frank’s buffalo sauce all vied for attention. The mild spice and pert vinegar tang of the sauce prevented the whole event descending into a sloppy, meaty farce. The “Mid-Western” was a more sedate affair in which a hearty portion of toasted onions and the superlative charring on the patties played the starring roles. I struggled to pick out the whipped garlic and miso butter, which sounded so great on paper. Needs more miso. 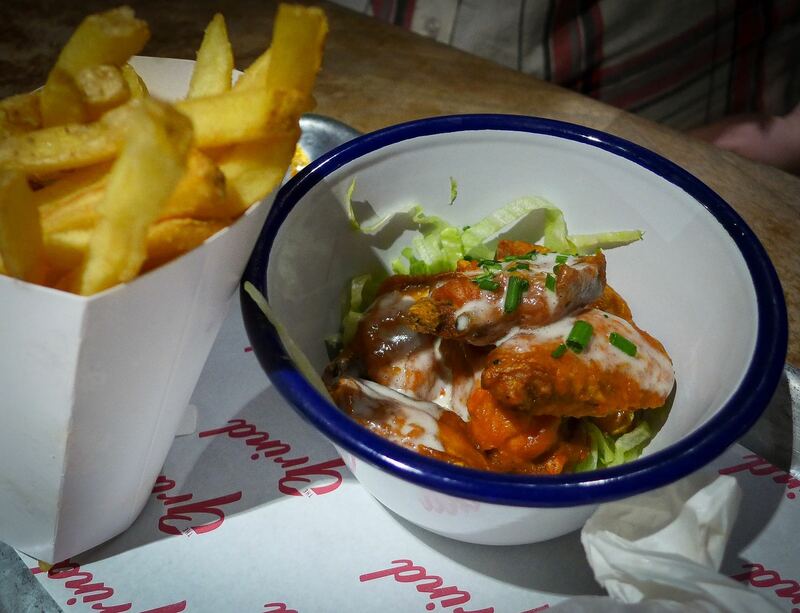 They do a mid-week special of any burger, buffalo wings and dripping fries for a tenner. If you’ve got a tenner hanging around doing nothing, take it there immediately. The wings are really good, with meat falling easily from the bone thanks to – thank goodness! - proper jointing. Are you listening, Reds True Barbecue? When you serve simple food, getting the simple things right is everything. There were two desserts available, so we took advantage of both. The peanut butter shake was superb. 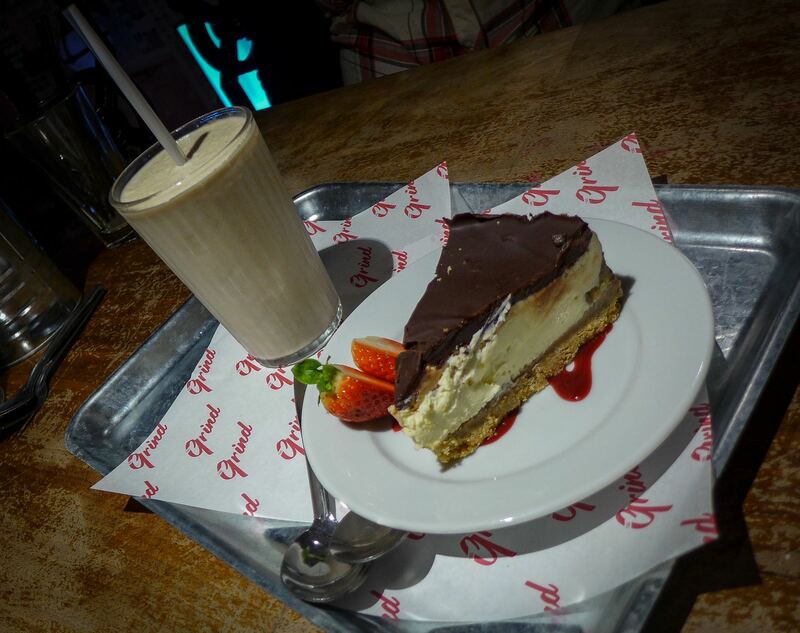 Meanwhile, a chocolate, bourbon and banana cheesecake was about as good as a non-baked cheesecake can ever be. I’ve often found burger and BBQ joints treating puddings as a mere afterthought. 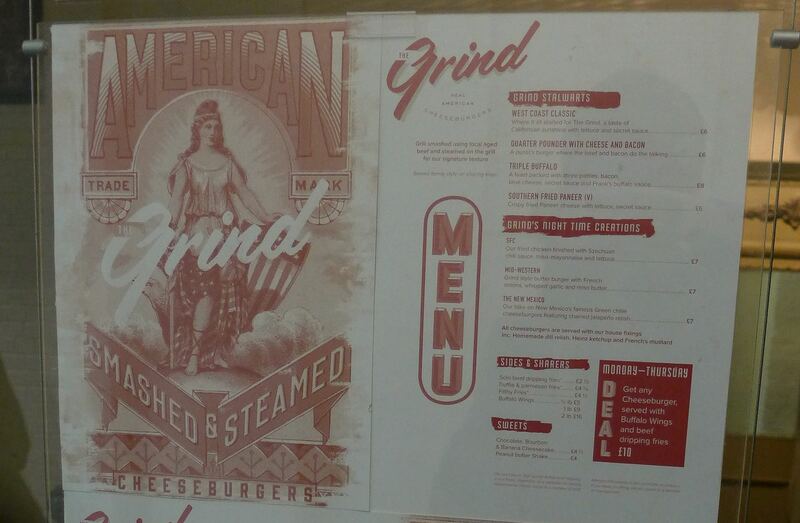 It was a treat to find that The Grind’s attention to detail doesn’t end once the meat has left the hotplate. Service, from some of the nicest bar staff around, was great. A bloke on a guitar was playing covers of pop standards really rather well, only pausing to tuck into his own burger, like a extended ad break. The choice of drinks, given that you’re in a quality bar, is obviously fine. Blue Point Brewery’s Toasted Lager was on tap. We left feeling full but not sickly. Portions here are well-gauged. Even that buffalo triple burger could be managed by most reasonably sized, reasonably hungry humans. If you’re one of that odd crowd that gets turned on by eating challenges then The Grind is not for you. You might even call them small. If, on the other hand, you get excited about well thought out and constructed burgers, cooked by people who have been paying attention to Californian operators such as In-N-Out, where success is all about simple, fresh ingredients and an amazing dressing, then get yourself up that staircase to No 28. In-N-Out's "Double Double Cheeseburger Animal Style with Animal Fries "
If you find anywhere doing it better, please let me know, and I’ll eat my words. And their burgers. I doubt you will.